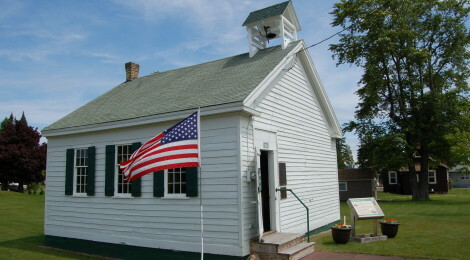 Michigan’s Keweenaw Peninsula is home to many surviving one-room schoolhouses from the 1800s, and one in Eagle Harbor has additional historic significance. 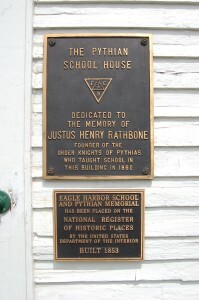 The Eagle Harbor Schoolhouse (or Rathbone Schoolhouse) dates back to 1853 and was where Justus Rathbone developed the basis for the fraternal order The Knights of Pythias. 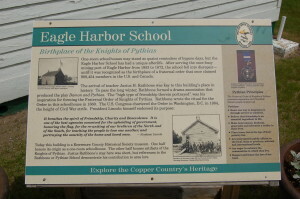 An information plaque in front of the school gives more background information: “One-room schoolhouses may stand as quaint reminders of bygone days, but the Eagle Harbor School has had a unique afterlife. 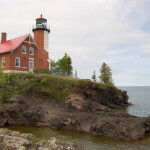 After serving the once-busy mining port of Eagle Harbor from 1853 to 1872, the school fell into disrepair – until it was recognized as the birthplace of a fraternal order that once claimed 908,454 members in the U.S. and Canada. 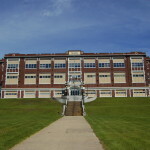 The arrival of teacher Justus H. Rathbone was key to this building’s place in history.To pass the long winter, Rathbone formed a drama association that produced the play Damon and Pythias. The “high type of friendship therein portrayed” was his inspiration for forming the Fraternal Order of Knights of Pythias. 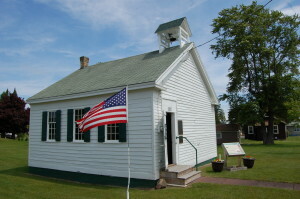 Rathbone wrote the ritual for the Order in this schoolhouse in 1860. The U.S. Congress chartered the Order in Washington, D.C. in 1864, the height of Civil War strife. President Lincoln himself endorsed its purpose. 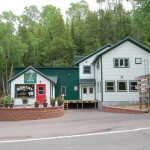 The schoolhouse is located at the intersection of Third St. and Center St., just a few blocks from a popular swimming beach and close to the historic Eagle Harbor Lighthouse. 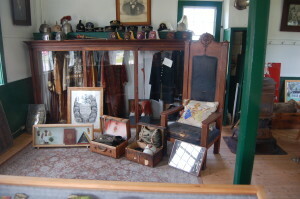 The Keweenaw County Historical Society keeps it open as a museum during the summer, with part of the school restored to show what it would have looked like while in operation and mementos from the Knights of Pythias in another exhibit. 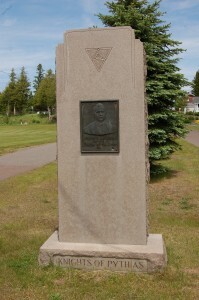 A stone monument to Justus Rathbone is located next to the school. The Order carries on today and pilgrimages are sometimes made to this site. Famous members of the Knights of Pythias include William Jennings Bryan, Warren G. Harding, Hubert H. Humphrey, William McKinley, and Louis Armstrong. 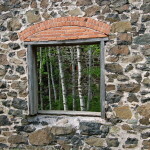 Find out more at http://www.pythias.org/.